YOKOHAMA - Decades of history. A well-stocked (if slightly dusty) trophy cabinet. A distinguished list of former players considered amongst the best in Japanese soccer’s history. Backing from one of the world’s most powerful ownership groups in the form of City Football Group, to say nothing of majority owner Nissan. With all this on Yokohama F. Marinos’ side, an outside observer would be forgiven for taking manager Ange Postecoglou’s claim of underdog status in the J. League’s first division with a grain of salt. Yet that is precisely the position in which the Original 10 club finds itself, contesting the 2019 season with one of its greenest squads in recent memory as rivals pack their rosters with expensive talent from Europe and South America. While Vissel Kobe has signed its famous trio of World Cup winners, Nagoya Grampus spent a blockbuster sum on Brazilian ace Jo and Kawasaki Frontale brought over London Olympics top-scorer Leandro Damiao, former Australia head coach Postecoglou has instead focused on building faith in his tactics from the ground up. “We don’t have the budget of the big clubs,” Postecoglou said on Saturday after his team’s 1-1 draw with Nagoya. “When I came here I knew that. We wanted to build a team that played attacking football as a team. That courage comes from youth — the team’s starters on Saturday boasted an average age of 24.64, well below Nagoya Grampus’ 27.18. 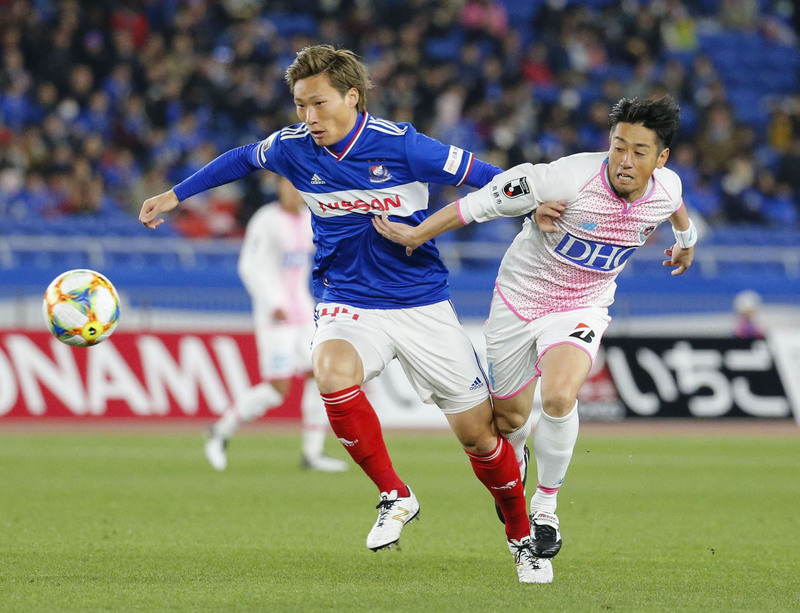 Yokohama has come a long way since 2013, when Marinos’ active squad was at its oldest. In that year’s Round 7 at Albirex Niigata, then-manager Yasuhiro Higuchi fielded four players born in the 1970s — defenders Yuji Nakazawa (’78) and Dutra (’73), midfielder Shunsuke Nakamura (’78) and striker Marquinhos (’76). Just one starter on that day, a 23-year-old Manabu Saito, was born in the Heisei Era. None had fewer than 50 first-division appearances. That’s in stark contrast to Saturday, when five Marinos starters entered with less than 20 J1 games. That included 29-year-old Park Il-gyu, the oldest player in the lineup, who made his third top-flight start. The draw featured plenty of end-to-end action as both teams traded counterattack punches and delivered double-digit shots (Nagoya led 15 to 12). There was also no shortage of defensive lapses, including recent Samurai Blue debutant Shinnosuke Hatanaka’s clumsy second-half giveaway which nearly led to a 2-1 go-ahead goal for Grampus. But Postecoglou backed his 23-year-old defender, further suggesting that the lack of veterans to guide the younger players has benefited their development. “When you talk about Hatanaka, the reason he’s in the national team is that he’s playing the football we want him to … and he’s also the player who set up our goal,” Postecoglou said. “I didn’t see players making mistakes, I see players endeavoring to play good football. Hatanaka, playing in his first full J1 season after joining from Tokyo Verdy last summer, doesn’t believe the lack of a senior voice in the locker room is cause for concern. The Kanagawa Prefecture native, who made a full appearance in Japan’s 1-0 friendly win over Bolivia last month, credited that experience for inspiring him to improve his game. Hatanaka’s desire for improvement is reflective of the process he and his Marinos teammates have undertaken in the second year of the Postecoglou regime. 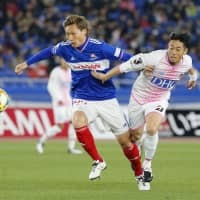 The team’s 12 points outpace the eight it had after seven rounds last season, which provided both entertainment (best exemplified by the team’s 8-2 thrashing of Vegalta Sendai last July) and frustration (only Yokohama’s goal difference kept the team above the relegation fray) in equal measure. Some of the most entertaining performances on display have come from Brazilian striker Marcos Junior, who along with four goals in seven appearances has won over fans with his “Dragon Ball”-inspired celebrations, and winger Teruhito Nakagawa, who has one goal and four assists. Postecoglou, who won the 2015 Asian Cup with the Socceroos and two A-League titles with Brisbane Roar, is confident that his high-pressing, high-octane tactics will not only lead to better results, but revive attendance which dropped nearly 3,000 per game from the 2017 season to 21,788 last year. “I’m 53 and I don’t know when I’ll stop coaching, but every team I coach will play this way,” Postecoglou said on Saturday. “I want people excited to come and watch this football.